Designed to make your life that little easier, these medical accessories will provide ease and light relief for when you’re taking medication, using eye drops or even writing a note for carers, doctors, friends, and family. Milercare provides a wide and varied selection of items that will aid you in your everyday tasks, as well as helping those around you to look after you too. 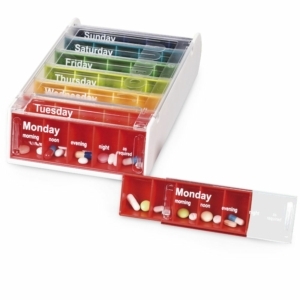 Whether it’s something as simple as a pill organiser to ensure that you take the right medication at the right time, here we offer the accessories you need at competitive prices. Prices start as little as £2.46 so you’ll find something to suit every budget. Carry out your everyday tasks with a lot more ease thanks to Millercare’s range of medical accessories, all at affordable prices. 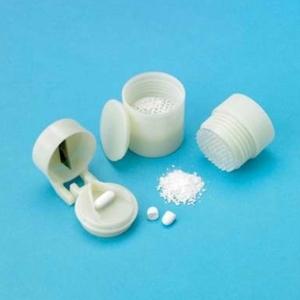 If you struggle to take pills in their original form purchase one of our Pill Crushers which are designed for use on uncoated medication and vitamins. 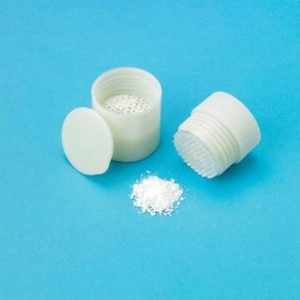 Use the screw action to crush the pills into a powder to be mixed in with a drink or put into food. They ideal for those with limited strength or mobility in their hands too. 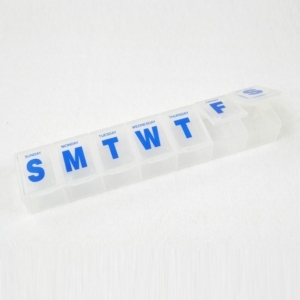 Small enough to be carried in your pocket or purse, and the upper section can be used as a drinking cup or medication for storage; these are really handy for anyone who struggles to take pills in their normal form. Using eye drops can be a struggle for some people, but with the help of the eye drop dispenser, you can make the situation a little easier. Plus it boosts confidence and supports independence. 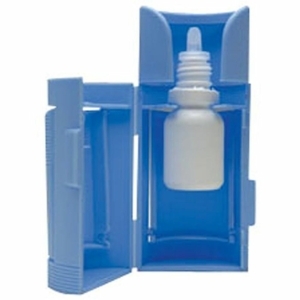 This simple device is designed to accurately and safely target the eye, which helps you squeeze the bottle. 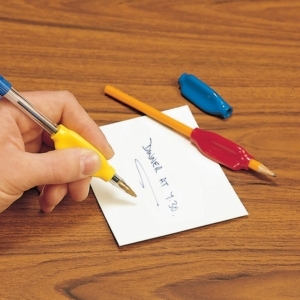 The grip size design makes it ideal for the elderly or those with arthritic hands too. 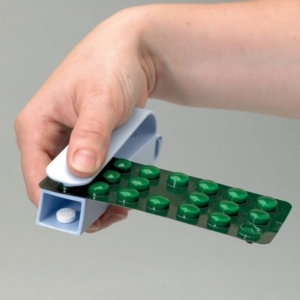 If you’ve ever struggled to get pills out of their packet then the Poppet Pill Remover will make life that litter easier and a little gentler on your hands too. 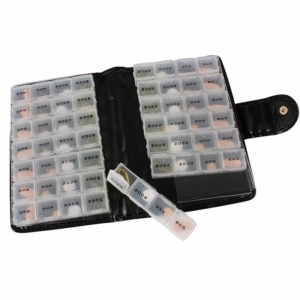 It works by pushing through the seal without the use of your fingers and collects them in the handle, taking away the need to handle small and awkward pills. Another tool that’s compact and lightweight to carry around with you too. 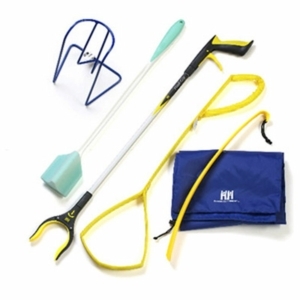 For those who have a limited range of movement, are recovering after a hip/knee/back surgery, dressing one handed or are at risk from a fall, the Hip Kit we have on offer is filled with a range of essential tools, each of which provides you with some of your independence back. If you really don’t want to take any more pills for pain, then the PainGone Relief Pen is the safe, drug-free therapy you have to try. The pocket-sized pain delivers a controlled electronic frequency through the nerve pathways to the brain. You simply press a button to deliver a low frequency, gentle electrical charge, produced by crystals, straight to the point of pain. With every click, you send a pulse that activates endorphins, the body’s natural painkillers to free you from pain. 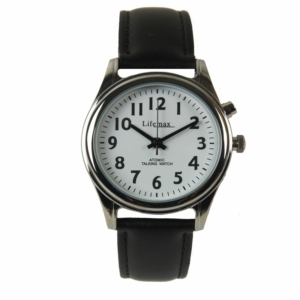 The Talking Watch is a great buy for those who struggle to see the numbers, the leather watch looks stylish and speaks the time and date in a clear voice. It also automatically adjusts between summer and winter time, with an automatic setting function by seeking the time signal in countries where available, including the UK, Germany, USA, and Japan. It can also be set manually for countries with no signal. Shop the range of medical accessories on Millercare now, or come and visit us in store to find exactly what you need.